Every time I have this chowder, I am reminded of the ocean. Clam Chowder has silky taste of the cream blended with the potatoes that is accentuated by the salty sea flavor of the clams. When I make this chowder my whole kitchen smells like I am just blocks away from the beach. 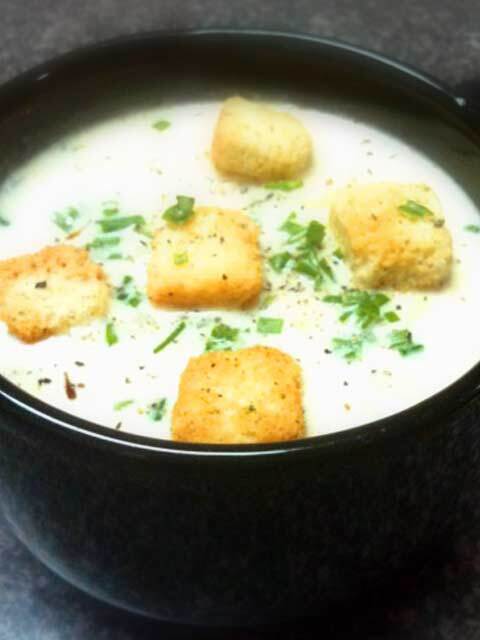 New England Clam Chowder is probably the world’s most recognized chowder. Chowders are usually considered soups. This is because commercial chowders you buy in restaurants are thin, flavorless and laking all heartiness. I believe that chowders are much more than a soup, a chowder is a complete meal. A homemade hearty clam chowder can be served as the main course and none of my guests will leave with an empty stomach. Wash the clams from dirt and mud. In a steamer, bring 1 cup of water to a boil. When the water is boiling, add the clams to the steamer and steam for 10 minutes. Remove the clams. The water will now contain clam juice. Reserver the clam juice for later. Remove the meat from the clams, discarding any unopened clams. Dice the bacon in a 1/4 inch die. Melt the butter in a large stock pot. Add the diced bacon. Cook until the bacon is crisp and brown. Meanwhile, dice the onion into a 1/2 inch die. Cut the celery into 1/4 inch pieces. Remove all the fat from the cooking of the bacon and butter only leaving 1 Tablespoon. Add the onions and celery with the bacon, and cook until the onions are transparent. Peel the potatoes. Dice the potatoes into a 1/2 die. Add the clam juice, potatoes, thyme and the bay leaf. Cook for 10 on boiling or until the potatoes are tender, but not mushy. Remove from heat. Dice the clam meat. Add the cream and diced clam meat into the pot. Add the black pepper. Let it cool down and serve with garnish of celery and croutons.